How Did A Doll Become Uncopyable? Most businesses today are getting hammered by commoditization. 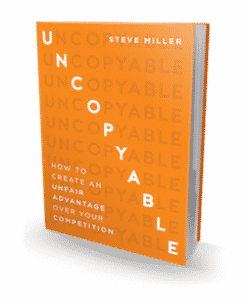 Technology makes it too easy to copy somebody else’s great idea, making it harder and harder to separate from the competition. But the American Girl doll and retail stores have managed to successfully create an Uncopyable attachment with young girls for over 20 years! They’ve taken a commodity and created a story and experience that gots far beyond any other “doll” available, including Barbie. Like my stuff? It would be awesome if you spread the word!